very cute, I do love the one in turquoise and it looks like it is tea time! I love the duck egg coloured chair! Trouble is...you'd never want to get up!! It must be the day for things cane! Yep, love the look you have here and definitely a tranquil place to relax with a cuppa! Very pretty. I just love that pale blue color, too. tea please and then a book to read. Indeed a pretty place. I can curl up with a good read all day. I agree Simone - these chairs are beautiful and comfy! Looks like a gorgeous spot to watch the world go by. Thank you so much!!! I have a chair just like the one above but it is a rocker.I was going to sell it at my tag sale but you made me fall in love with it all over again! Have a Great Week!!! I am currently on the hunt for a pair of wicker chairs, I completely adore them. piled with some cosy cushions, bliss. Glad to see you at Dreaming! I totally agree. 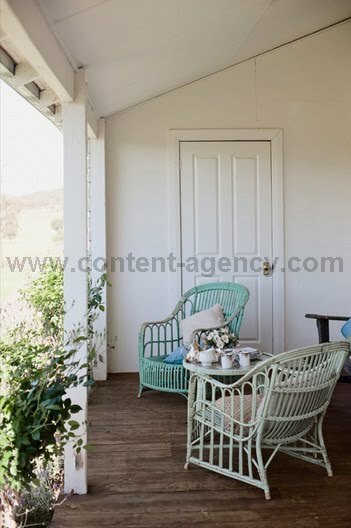 There's nothing like an Aussie verandah with a couple of cane or wicker chairs and a nice spot of tea. Seems to be a theme, this day of American Summer Solstice, of colored cane chairs. Simone, I just looove that gorgeous bluey colour chair - wicker is just so lovely on the verandah. 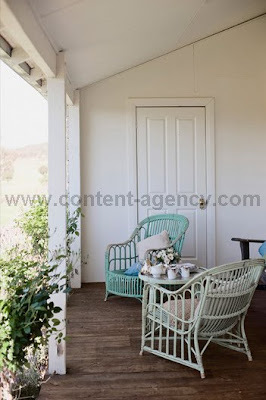 I have just done a post on my front "porch" and have some pretty buttercup yellow wicker chairs. Pop over for a visit if you have spare time. 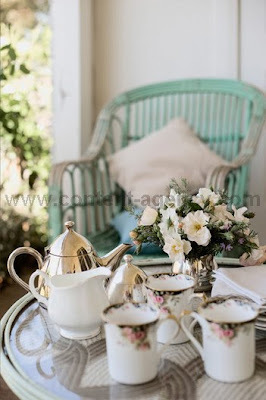 Just gorgeous - love the tea set. Wow, great chairs, ok, but I ADORE the porcelain!!! Drops of joy!! Bela. hola simonne!!!!!! absolutely beautifull a corner like that..invites you to be calm and enjoy and relax!!! the post of yesterday of your little girl draw in my face an enormous smile! !she is adorable and l can imagine her walking with that heart stone.... so so so sweeeeeeettttttt !!! !muchos besos for both of you and have a beautifull and happy week!!!! I could kick myself for ever getting rid of my vintage wicker. When we moved, I knew we were going "modern" so I let them go but I've since figured out, comfort and classic design will go with anything. Darn it. Thanks for the birthday wishes over at Shh...It's Lizeylou! How divine is Mr Efron!! It's not about the wobble is it? It's about the lifestyle. Love that aqua color. yes I adore them! !.........and how lucky was I too come across some to adorn my deck too.......well when the rain goes away + the sun stays then I can bring them out! !........roll on summer! !